There are two kinds of tubes in knitting: pass-through tubes (like sleeves) and dead-end tubes, like socks, mittens and hats. Often, patterns call for making these seamlessly using a special skill --using double pointed needles (dpn's) or by using an alternate method, such as using a too-long circular needle called "magic loop" (after a pioneering book--well worth owning! !--of this same name). This special skill may be used for the whole garment (knitting a sweater in the round) or for part of a garment (the sleeves on double pointed needles). It may be modified into flat or flat-ish circle knitting for the dead-end part of a hat, sock, thumb; or for the center start--or end--of a hat, or flat shawl or blanket. Now, the thing is, many knitters dread dpn's or magic loop to the point of avoiding them. 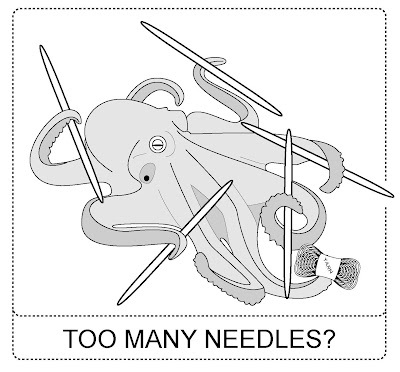 Worse yet, some knitters avoid even thinking about learning how--it looks too complicated, too fussy, too much like something for an octopus with 8 hands, rather than a knitter with only 2. This is the first in a series of posts--eventually this series is going to lead into 1) a how-to on operating dpn's, and 2) a how-to about knitting tubes and circles with magic-loop on one too-long circular needle. But there's no sense starting with the "how to" if you don't think the effort is worth it in the first place. In the hopes of persuading the dpn-o-phobic, the seamless-tube-o-phobic, the "center-start"-o-phobic, the "magic-loop"-o-phobic to change their ways, here's a piece on why you might bother to learn in the first place. WHY BOTHER LEARNING TO KNIT SEAMLESS TUBES AND CIRCLES? You could make a tube by creating a piece of flat cloth, and then sewing it up. That's actually how most clothing IS made--the fine art of dressmaking involves taking flat cloth and forming it into tubes that (like Swift's fleas, ) have littler tubes upon 'em--a big pass-through tube for the body, smaller attached sleevish pass-through ones for the arms and legs, little dead-end tubes for the hands and feet , sometimes with littler dead-end tubes yet upon those--the fingers in gloves, the thumbs in mittens. Folding flat rectangles into tubes isn't restricted to woven cloth--knitting can be done this way too--that's what all the recipes for sweaters in 5 pieces are about, and "two needle" mittens and hats--knitting a flat piece or panel of cloth to be sewn up along various specified edges into the tube of choice. In dressmaking (as the sewers among you know) there are limitations to tube-creation. First and most obviously, people stretch, but woven cloth doesn't--or doesn't very well except along the bias, and even that is very limited. So in order to create wearable tubes, there are two possible approaches. First, the tubes can be made roomy enough to move around inside of (they have to have sufficient "ease"). An alternative approach is to create tubes fitted to the body (by gores, panels, sleeve caps or darts) so the excess cloth necessary for ease does not bind. These fitted garments have to be provided with openings to let the wearer climb inside them (plackets) and also be provided with a method for closing these openings (zippers, buttons). Using stretchy fabric, like knitting, makes a lot of these problems go away. Because the knitted fabric IS so stretchy, less ease, less shaping and fewer openings have to be provided. And this is especially true for pass-through tubes. If your hand can pass through the sleeve and pop through the cuff, but the cuff stays small enough to snug around your wrist, you don't have to sew (and face) a slit cuff with a placket, button band and buttons. Less work all around, and more comfortable, too. So, if you are knitting flat fabric and sewing it together into tubes, you're already got woven cloth garments beat all hollow for stretchy comfort. And perhaps, that is where you are inclined to stay--with seamed two-needle, pass-through-tube-garments, knitted flat. But, although seamed knitting is far superior in stretch and comfort to seamed woven fabric, there are problems with seaming even knitted fabric. A seam of a sewn tube stops the stretchy knit fabric from stretching. Stopping stretchy-ness isn't much of a problem on a big pass-through tube, like a sweater body--it might even be a sag-stopping advantage. But on a small tube, like a sleeve, the situation is dicier. When we turn to dead-end tubes, the problem only gets worse. On a tiny tube like a mitten thumb or glove finger, or even on a sock, lack of stretchy-ness IS a problem. When knitted socks and stockings were first invented, their stretchy properties were so astoundingly comfortable compared to the non-stretchy footwear they replaced, that they were considered precious objects--worth breaking and entering for, and listed in the inventories of rich folks' estates. Knitted stockings were presents considered fit for royalty. And lack of stretchy-ness isn't the only problem raised by seaming knitted fabric. You see, the smaller the tube, the greater the proportion of the tube which is taken over by the (possibly unsightly, possibly bulky, possibly uncomfortable) seam. Trying to cram your actual finger AND a seam into a glove finger of proportionate size might be a trick. The seam in a sock could be painful to tread upon. Heads are harder than fingers and toes, but it still might be annoying to have the knot of a hat seam on your forehead, ear or the back of your neck. OK, so in the best of all possible worlds, we'd all knit seamless tubes, right? Make ourselves a pair of socks fit for the queen of England? And maybe you'd be willing to read more about the idea behind all those double pointed needles? Or how it works to make a little tube with a big long circular needle twisted into a "magic loop?" Stay tuned until the next post--part 2 of knitting seamless tubes & circles.